Today we are delighted to welcome back Ana Sofia who blogs at S is for Sewing. She is a mother of three living in Portugal. On a previous visit she shared a tutorial about adding honeycomb smocking to the Ice Cream Blouse. 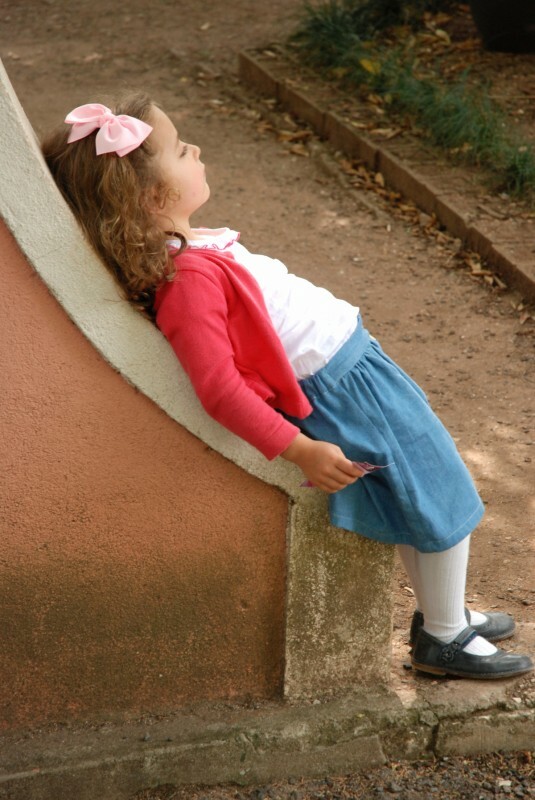 Ana Sofia is stopping by today to tell us all about her favorite Oliver + S pattern. Here she is. I love reading the favorite pattern series here on the blog, but when asked about my favorite Oliver + S pattern I didn’t have a prompt answer. The reason? I’m not sure if I have “one” favorite Oliver + S pattern at all. I can easily pick a handful (or more) of favorite Oliver + S and I’m sure more will be added with the new releases (and I know, I’m not alone, right?). Fortunately for me, some patterns were already “favorited” before, so the selection was a bit narrowed down. Nevertheless, I declared the Hopscotch Skirt my Favorite Oliver + S pattern, because it’s probably my most-sewn skirt pattern and it’s been in my girl’s closet since it was introduced (fall 2010). Usually I don’t sew many skirts for my girl. When she was a baby, skirts and dresses were not my favorite pieces of clothing as these didn’t actually fit well with crawling or early walking attempts. But after the first year, I was happy to fill her closet with skirts and dresses. However, it didn’t take me long to realize that skirts were often backwards after a while. So, when the Hopscotch Skirt was released (my girl was 2 1/2 years by then) I immediately loved it. The main reason, besides featuring the most adorable Chinese takeout pockets, was the distinctive front button placket. That way my girl would always tell the front side from the back side. Thanks to the Hopscotch Skirt pattern, skirts were allowed back into my girl’s closet. My first versions were made of corduroy (thinking of the colder months ahead). You could see them here, paired with the coordinating Hopscotch Top (City Weekend knit) and a Liberty Music Class Blouse. While I actually didn’t find it difficult to sew this skirt in corduroy (the pockets were a bit challenging, but totally doable) sewing it in cotton with the arrival of the summer months was really a pleasure. 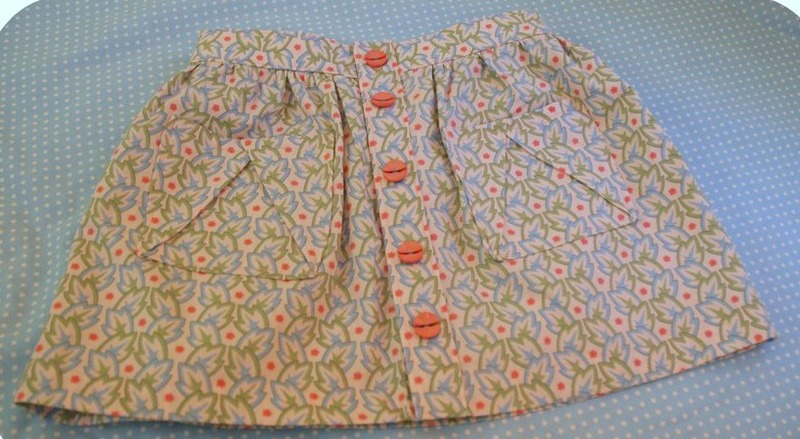 And picking buttons for the new skirt soon become my girl’s favorite part and a great way to involve her in the sewing process. 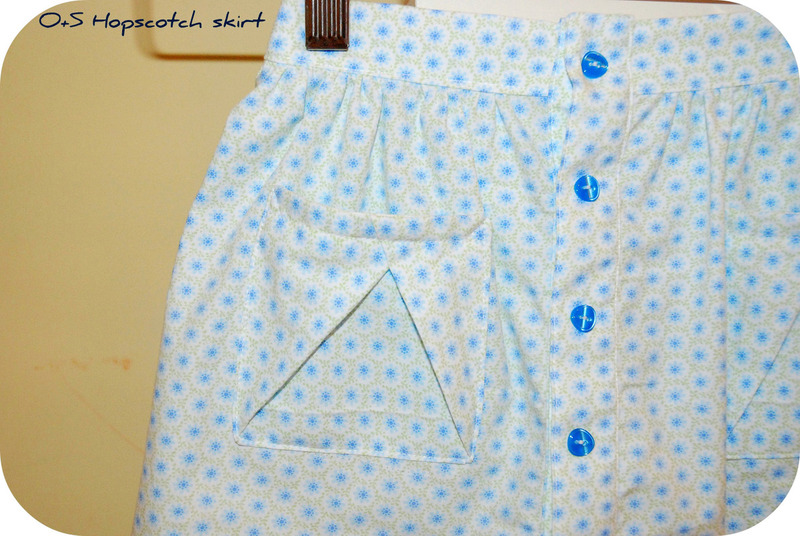 A little confession: I don’t actually sew the buttonholes in my Hopscotch Skirts as one can easily put this skirt on without them (it has an elasticized back-waist). Even when in a rush, I was able to sew a Hopscotch Skirt in a few hours. Just skip the pockets and you’ll have a basic skirt that will match most everything. This chambray version was a last-minute sew and it become one of her favorites (and one that couldn’t be handed down to another girl, because it was literally worn to pieces). Last winter this navy corduroy skirt was worn with everything. I wish I had a better picture of this skirt. I love the contrasting wooden buttons. 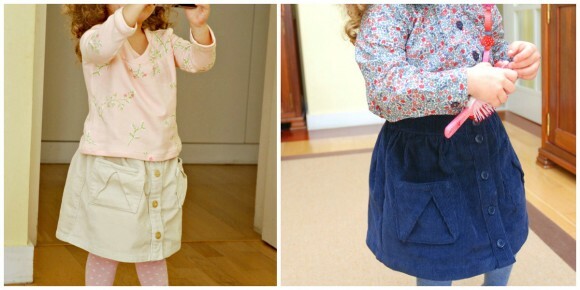 Currently, there are two Hopscotch Skirts in heavy rotation in my girl’s closet. 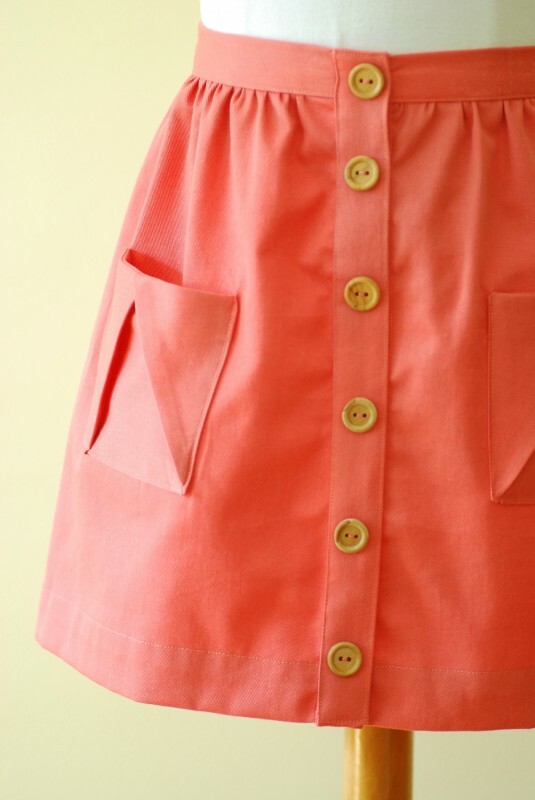 A peach colored twill version with wooden buttons, which I love because it pairs so nicely with the navy and earth tones already in her wardrobe. The crispy twill actually lets you see the tiny gathers at the front waist – just enough to make the skirt bounce and fit nicely. 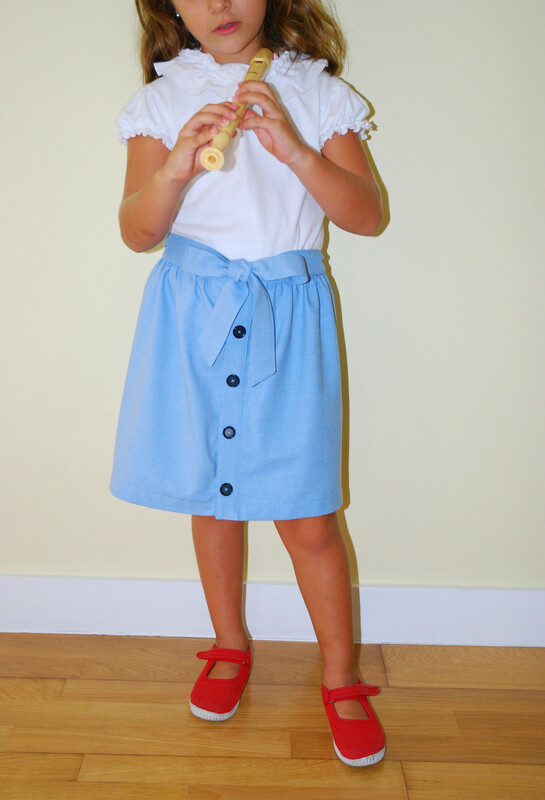 And my favorite so far: a revised chambray version of the original Hopscotch Skirt using Liesl’s instructions for adding a front sash to the Hopscotch Skirt (although mine is actually 2 inches shorter, because I ran out of yardage). I might go back and add the Chinese takeout carton-inspired pockets (I had them cut before deciding to go with the sash). Or I could just leave it as it is. 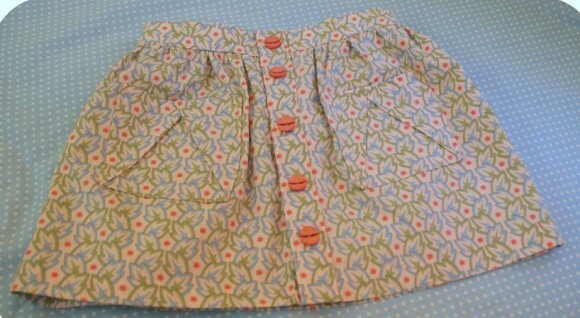 A perfect Hopscotch Skirt ready to be worn with … well, everything, actually. So, there you have it. 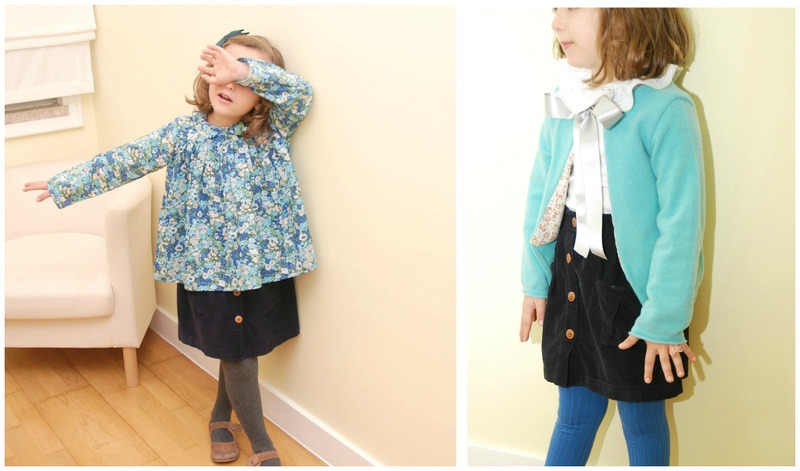 While the Hopscotch Skirt is not my most blogged/posted item, I can ensure you that’s definitely one of the most sewn (by me) and worn (by my girl) in her wardrobe. After all, every girl needs a basic skirt pattern in her closet and no one does it better than Oliver + S.
I love all the versatile ways you’ve made and styled this. I can’t decide which one I like best! I love these “favorite pattern” posts, too. 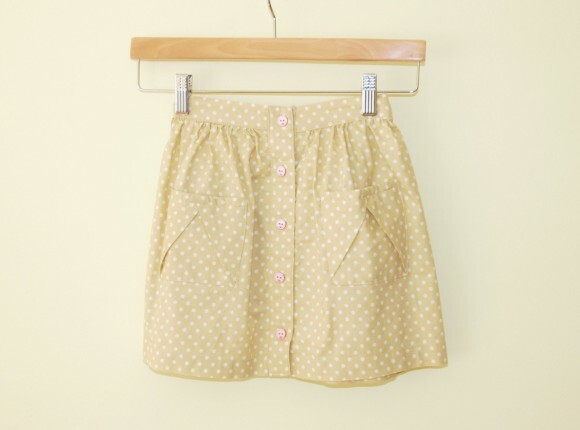 This pattern and the swingset skirt are top on my list for spring sewing! Although now that I see the lovely corduroy versions perhaps I could sew it earlier! Thanks for all the wonderful inspiration! What a great pattern… I love all versions! I am a sucker for corduroy and chambray so I think those are my favorite. I was looking for a skirt pattern for my girls, I think I just found i! Not being a huge fan of skirts (at least on my “never-stay-still” girl), this pattern is perfect – I always add a couple of new versions to my girl’s wardrobe every season! I really like this skirt – always have- but since I don’t do knits, I’ve hesitated to purchase it. However, your sewing is charming, and I’m a big fan of corduroy for children. The parents love it, too because the colours are so intense, and the fabric is so hardy. I do like the bow at the front – that really makes the skirt look very special. Perhaps when O+S has a sale, I’ll reconsider it. My little clients ‘adore’ skirts, and it’s so nice to have more options. And those pockets are so ‘different’. And yes, I do know exactly what you mean about skirts on toddlers – they are really a more viable proposition from 3yrs onwards, IMO. 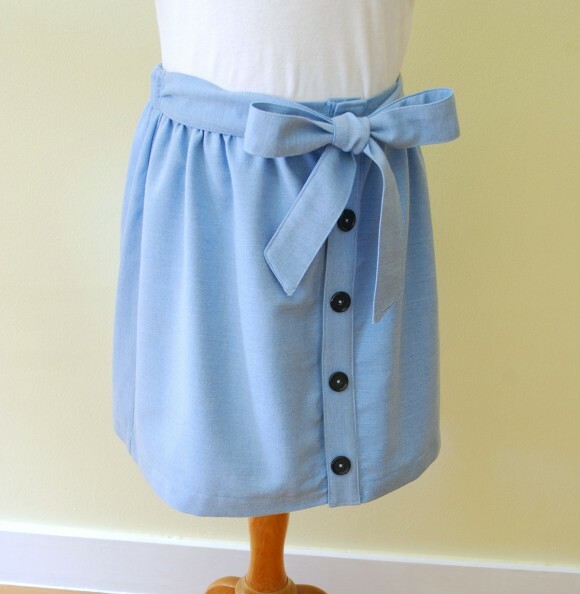 Oh, I love the Hopscotch skirt, too! I’ve had a the sash version on my list for almost a year now…I love yours, and all your other hopscotch skirts, too. You’re right, it’s the perfect basic skirt! Such lovely skirts, Ana Sofia! I love this pattern too. It is so simple but so special at the same time! I just sewed my first hopscotch skirt and love it dearly. Your little cheat to not make button holes is GENIUS! Thank you for sharing your lovely skirts.